If there is no timeline provided for the creation of a new school system to be administered by Nunatsiavut, amending or revising the current one should be considered a top priority. Test scores, enrollment and graduation rates are extremely low, when compared to the other regions of the province. It’s important to remember that a new program or system cannot be created without the cooperation and consultation of both the Inuit and Newfoundland and Labrador Department of Education. 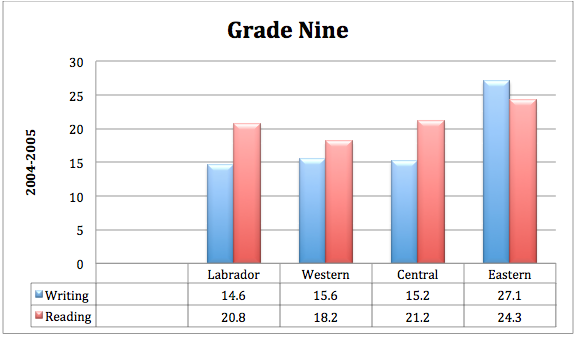 Below are some statistics provided by the Newfoundland and Labrador Department of Education. The government regulates Criterion Reference Tests (CRTs) for all students at the end of grades three, six and nine. These tests are identical and administered to all students. 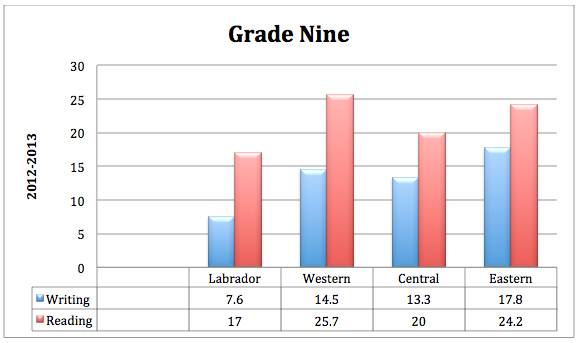 These graphs demonstrate the discrepancies between the scores of those in Labrador compared with the rest of the province. It is difficult to get exact statistics, because other Aboriginal students including the Innu and Metis are included in the Labrador statistics. The 2004-2005 school year was the last school year in Labrador before the Land Claims Agreement was ratified. In a comparison with eight years later, in the 2012-2013 school year, things have not improved.